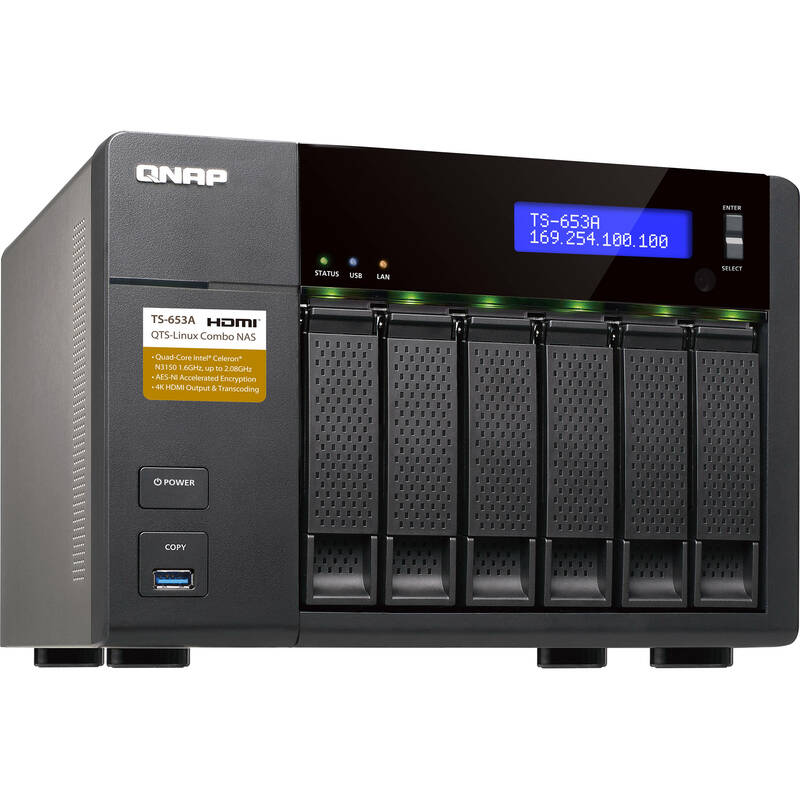 The QNAP TS-653A 6-Bay NAS Enclosure runs on the QTS 4.2 operating system and is able to function as a NAS server for data backup, file archiving and synchronization, remote access, and home entertainment. Its six bays can support 3.5" or 2.5" SATA III hard drives or SSD drives. Once drives are installed, the QTS operating system lets you configure them into RAID modes 0, 1, 5, 6, 10, or JBOD, providing reads speeds of up to 416 MB/s. This NAS is also able to perform on-the-fly and offline video transcoding, including Full HD 1920x1080 content and playback of 4K content with 7.1 channel surround sound via the HDMI ports. The TS-653A is designed for SMB users and is compatible with Windows, Mac, Linux, and UNIX systems. It is powered by a 1.6 GHz Intel Celeron N3150 processor that comes with four cores so you can run multiple functions simultaneously. The CPU can also achieve speeds of up to 2.08 GHz, the built-in 8GB of DDR3L RAM allows quick access to frequently-used files and programs, and network connectivity is achieved via four Gigabit Ethernet ports. QNAP has equipped this NAS enclosure with two HDMI ports along with four USB 3.0 ports. You may connect up to two displays as well as a keyboard and a mouse to control this NAS without the need of another computer. Furthermore, the two HDMI ports utilize the visual performance of integrated Intel HD Graphics to deliver 4K resolutions. The TS-653A protects your data with AES 256-bit hardware encryption and supports data recovery and redundancy options. In addition to backup support on Windows and Mac, it offers real time or scheduled data backup to a remote NAS or FTP server as well as rsync to back up to another remote server on a scheduled basis, such as cloud storage. Powered by a 14nm quad-core Intel Celeron N3150 1.6 GHz processor with 8GB DDR3L-1600 RAM, coupled with the support of SATA III, 4 Gigabit LAN ports, the TS-653A is a NAS that delivers up to 416 MB/s read speeds. The TS-653A can automatically increase the processor's clock rate from 1.6 GHz to 2.08 GHz when performing CPU-intensive tasks. The TS-653A features Intel AES-NI hardware-accelerated encryption engine to drive transfer speeds of up to 416 MB/s with AES 256-bit encryption for both full NAS volume and shared folders, boosting system performance and security while ensuring the safety of sensitive business data stored in the TS-653A. Featuring 8th-generation Intel HD Graphics, the TS-653A supports 4K (H.264) hardware decoding and delivers real-time 4K (H.264) and 1080p video transcoding to convert videos to universal formats that can be smoothly played on PCs, mobile devices, and Smart TVs. With offline transcoding, you can connect using a low-speed Internet connection and still enjoy smooth video playback via File Station, Video Station, and the Qfile mobile app by selecting a pre-rendered lower resolution video. The TS-653A also allows you to set a dedicated folder for automatic video transcoding. The QNAP operating system offers an intuitive user interface so your NAS experience is smarter and smoother. Its modern flat design streamlines loading times. The intelligent desktop allows you to find desired functions quickly, creates desktop shortcuts or group shortcuts, monitors important system information on a real-time basis, and opens multiple application windows to run multiple tasks concurrently, bringing working efficiency. QTS brings optimized cloud experiences to you and incorporates advanced features including volume/LUN snapshot, remote connection to public cloud services in File Station, multi-zone multimedia system, and more. The TS-653A offers various data recovery options. RTRR (Real-Time Remote Replication) supports real-time or scheduled data backup to a remote QNAP NAS or FTP server and synchronizes files to a remote folder from a local folder with better backup efficiency. The TS-653A also supports the rsync protocol to back up data to another remote server on a scheduled basis. Data can also be backed up to and restored from a range of cloud storage services, including Amazon S3, Amazon Glacier, Microsoft Azure, ElephantDrive, Dropbox, Google Drive, and Google Cloud Storage. The QTS Storage Manager app lets you easily restore data on the TS-653A back to any point in time in the event of important data lost. You can take snapshots for both volumes and LUN (up to 256 snapshots per volume or LUN and maximum 1024 snapshots per NAS), efficiently replicate volume/LUN snapshots via Snapshot Replica to remote servers by copying only the changes made, and quickly clone a volume /LUN snapshot as a local volume without interrupting the current system operation. You can even set up the system to automatically take a snapshot of the volume before backup via RTRR/rsync, even when the file is opened. The TS-653A is also an iSCSI/ IP-SAN storage device that supports VMware and Citrix, and is compatible with Microsoft Hyper-V and Windows Server 2012, benefiting flexible deployment and management in virtualization environments. The TS-653A supports VMware VAAI and Microsoft ODX to increase performance by offloading server loading for ESXi server and Hyper-V respectively, and supports QNAP vSphere Client plug-in and QNAP SMI-S provider with enhanced operational efficiency and management in virtualization applications. With the support of QNAP's VM hypervisor, Virtualization Station allows you to host virtual machines on your NAS and access them via a web browser or VNC. Virtualization Station further uses SDN (Software-defined Networks) which allows the TS-653A and VMs to share the same LAN port. No longer constrained by physical network performance, high-speed Virtual Switches increases the data transfer between VMs as well as between VMs and NAS through the internal interface. This NAS also features Container technology for server virtualization. QNAP's Container Station integrates LXC and Docker lightweight virtualization technologies, allowing you to operate multiple isolated Linux systems on the TS-653A as well as download apps from the built-in Docker Hub Registry. Container Station also supports the Online Document app, which allows you to directly view, edit, and store files of various types anytime on your NAS, including Office documents, images, and text files. The TS-653A supports SMB/CIFS, NFS, and AFP protocols for file sharing across Windows, Mac, Linux/UNIX networks. Data, logs, and ISO images of CDs and DVDs can be centrally stored on the TS-653A and protected by an integrated antivirus solution. The Windows AD and LDAP services enable system administrators to configure user permissions by using an existing Windows AD server, LDAP server, or built-in LDAP service. The TS-653A supports SAMBA v4 and can act as a Windows domain controller to manage privilege settings. The front-panel USB 3.0 port of the TS-653A features a one-touch-copy function for you to instantly back up data from external drives to the TS-653A with just one click, or alternatively to back up data from the TS-653A to external drives. With HDMI connectivity, you can connect the TS-653A to a HDTV or an A/V receiver to enjoy your multimedia content and 4K H.264 videos with the best audio/visual experience. The included QNAP remote control lets you control the playback of your content. You can also turn your mobile devices into remote controls by installing the Qremote app. The TS-653A comes with dual HDMI outputs for using two monitors in either a "mirrored" or "extended" desktop configuration. While mirroring displays the same content on both displays, extended desktop mode allows users to display applications over two displays for improved multitasking convenience and productivity. The TS-653A can be used as a VPN server with L2TP/IPsec, OpenVPN, and PPTP support, allowing you to securely access data shared within the private local network. The TS-653A can also be used as a VPN Client to connect to other VPN servers or virtual private network through for PPTP and OpenVPN for secure data transmission. VPN Client also allows your NAS to connect to multiple servers at the same time. You can connect your devices to your NAS and the VPN server at home to access data on the LAN; moreover, via VPN Client on your NAS, you can connect to VPN servers in the United States for accessing regionally-restricted services such as Netflix and Hulu in HD Station. The TS-653A provides you with various VPN options and helps secure your data transmission. The TS-653A also supports setting up a proxy server. The Proxy Server Package can configure the cache size, supported transmission protocols, record web pages you browsed and set up a content control system that limits the use of the Internet. Other features include a work log that remembers users' habits and preferences and SquidClamav anti-virus for proxy servers to ensure connection safety. The TS-653A has two 1/4" microphone jacks for connecting up to two dynamic microphones. Compared with the average reception quality of USB microphone, the TS-653A offers a clearer reception quality as it is equipped with a 20-bit analog-to-digital converter (ADC). On top of that, the TS-653A has a 24-bit digital to analog converter (DAC) that can send audio signals via the line-out jack to your amplifier and deliver clearer stereo sound. The TS-653A supports online capacity expansion for archiving rapidly-growing data by connecting an optional QNAP expansion enclosure. With the QNAP scale-up solution, the raw storage capacity can be expanded on demand, making the TS-653A a suitable file center with large storage capacity for storage-intensive business applications such as video surveillance, data archiving, TV broadcast storage, and more. With the support of QJBOD Express, you can just connect a large capacity QNAP expansion enclosure to the TS-653A and migrate data to another NAS through the JBOD enclosure without network connectivity. The built-in App Center provides various install-on-demand apps developed by QNAP and third-party developers, including tools for backup/sync, business, content management, communications, download, entertainment, and more. It is also a centralized location for managing and updating installed apps. You can directly update the installed applications in the App Center once the updated version is released. Box Dimensions (LxWxH) 15.8 x 14.4 x 10.6"
TS-653A 6-Bay NAS Enclosure is rated 4.0 out of 5 by 1. Rated 4 out of 5 by Steve from Great product with weakenesses Bought it to be a Plex Media server for my hundreds of DVDs. Used in conjunction with Handbrake and Sly Fox AnyDVD HD, works fantastic. Ripping physical media to file and uploading is easy and pain-free. Initial setup was pretty easy; their wizard works pretty well. The biggest problem I have with it is disk management. When I first set it up with RAID 6 and 4 x 12TB drives, there was an unaccounted-for 4TB that I had no idea where it was. Turns out I think that 4TB is guaranteed snapshot space, which is good, but I haven't found anywhere on the UI that says that. Managing disk space is not easy. You cannot shrink a volume, only expand it. So if, like me, you created an additional volume for your data, you can make it only so big. The default volume is fixed in size or you can grow it. Having said that, the unit runs well with 8GB of RAM. I like the fact it runs UNIX; you can SSH in and run commands if you want. Plex is a great media server.